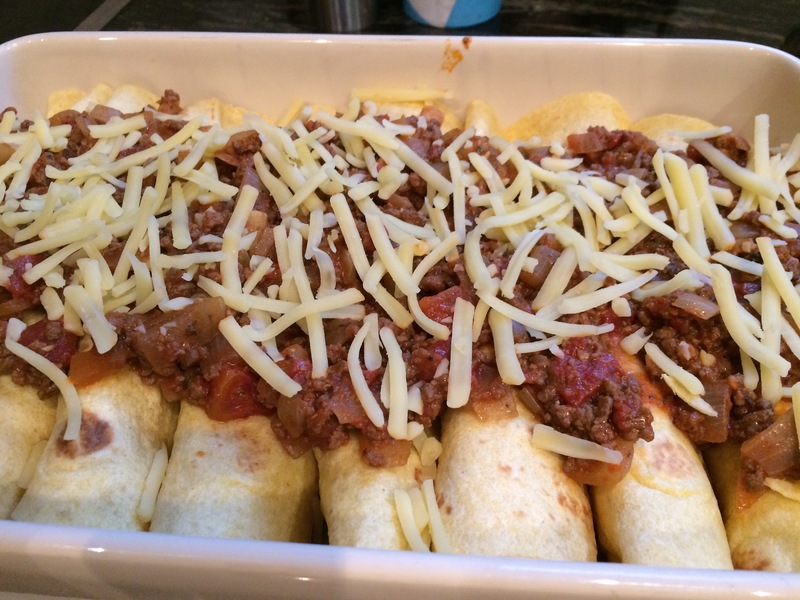 Enchiladas – the Mexican equivalent of a lasagne (or so some say) can be filled with many different ingredients; chicken, turkey, beef, cheese, beans, vegetables and so on. Some recipes include lots of sauce, but some are more like this one which for us is perfect. I used gluten-free tortillas which are quite easy to make using a corn flour, or alternatively a coconut flour, or they can be bought ready-made – just make sure they are gluten-free. We loved the crispy edges with the really moist filling. Roll the tortillas up tightly when making and they stay together to serve. Grease a baking dish with oil. Heat a little oil in a fry pan over a medium heat and cook the onions and garlic for 10 minutes. Add the beef and cook, stirring continuously, until the beef has browned. Stir in the tomatoes, stock, chilli and oregano and simmer for at least 15 minutes. Once the mix has thickened, season with salt. Leave half of the mixture to one side. Place a line of the meat mixture on to a tortilla. Add a little cheese, roll up tightly and place in the greased dish. Spoon over the remaining mince and sprinkle with the rest of the cheese. At this stage, they will sit in the fridge quite happily until you are ready for cooking. Heat the oven to 200°C and bake for 15 to 20 minutes until piping hot right through. As I had made my enchiladas earlier in the day, I baked them for about 40 minutes (covered with foil until the last ten minutes) to make sure they had fully reheated. Serve with either soured cream or natural yoghurt. 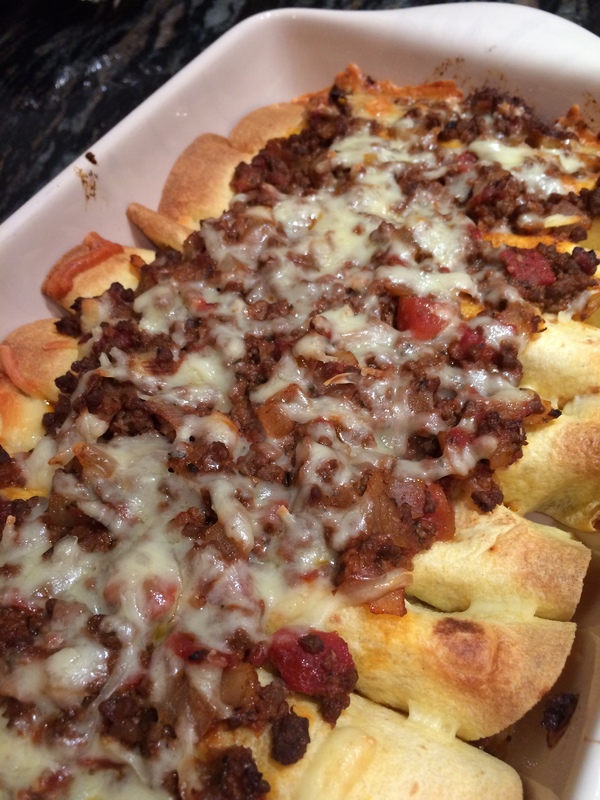 This entry was posted in Dinner, Lunch, Supper and tagged Chilli, Dinner, Enchilada, Gluten Free, Healthy Eating, Lunch, Mexican, Minced Beef, Tomatoes, Tortilla, Wheat-Free. Bookmark the permalink. For religious reasons I don’t eat milk and meat mixtures though, I wonder if it would better to use vegetarian mince, or make it with meat and leave off the cheese? It would be a shame to leave off the cheese as this really adds to the dish. Perhaps making a vegetable ‘mince’ would be preferable, or perhaps using a vegetarian version of mince.